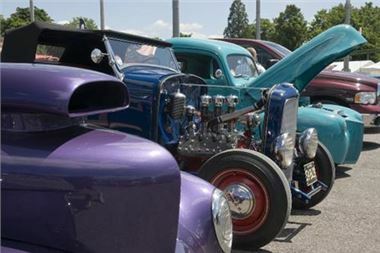 The biggest and best Hot Rod and Custom Car Show in the south, South Coast Internationals will be held in the grounds of the National Motor Museum, Beaulieu, from the 17th – 19th June. Now in its third year at this venue the show has built up a huge following which last year attracted over 600 custom cars and bikes and had an attendance on the Sunday of just under 6,000 people. This annual weekend event, organised by Victory Wheelers, is held in the parkland of the world famous motoring attraction at Beaulieu and is a great weekend for all custom car enthusiasts, so why not come along? Your ticket includes weekend camping from 2pm on Friday, 17th June, with excellent amenities such as on-site catering and hot showers. Among the activities lined up for the weekend are a Saturday Cruise, taking in the beautiful scenery of the New Forest National Park. There is a bar and music on both Friday and Saturday nights in the Surf City Diner, hosted by DJ ‘Mick Mears’, On Saturday night there will be a special appearance by Craig Jefferson, My Way, A Tribute to Elvis as well as entertainment by Burlesque. On Sunday, you can display your custom vehicle on the Beaulieu Arena as part of the Hot Rod & Custom Drive-In Day. Your weekend ticket also allows entry to the National Motor Museum with its collections of over 250 vehicles, telling the story of motoring on the roads of Britain from the dawn of motoring to the present day, the new ‘Feats of Endurance’ Exhibition and World of Top Gear, Palace House, home of the Montagu family since 1538, as well as Beaulieu Abbey ruins and gardens. If you can’t stay for the whole weekend why not come along on Sunday, 19th June for the Hot Rod & Custom Drive-In Day when owners are invited to bring along their custom vehicles to display in the Arena and surrounding parkland of the Beaulieu attraction. All are welcome, including Hot Rods, Customs, Classic Americans, Chops and Bobbers. Live music will be provided by the Ace Trio Rock-A-Billy Swing. There will be prizes for the best custom vehicle in each decade from the 1920s to the 60s, presented by Lord Montagu. Other prize categories will include Best Bike, Best American Choice and Best in Show. Sunday only entry, in a Hot-Rod, Custom or American vehicle, is £10 per adult, with free entry for an accompanying child and £5 for any additional children. To take advantage of the special advance ticket price of adult £7.50 and child £3.50 telephone 01590 612888, or book online at www.beaulieushop.co.uk. All other visitors to the Sunday show will be charged the standard Beaulieu admission charges. Admission includes entry to the whole Beaulieu attraction including the National Motor Museum with the new Feats of Endurance Exhibition featuring a number of vehicles that have stretched the boundaries of motoring endurance, both in extreme conditions and on challenging terrain. In World of Top Gear see cars from some of the most recent challenges including the Middle East cars from the 2010 Christmas Special.